This table is second to none. This purchase of Pro Am table and cover has been the most enjoyable of all time. Heath Manning is the reason. Thru out the 2 month process he has upon several occasions promptly answered all of my concerns and questions in a kind and professional manner. The table was delivered 3 weeks early YAHOO! Advantages: I am tickled with the solidness of the banks, how easy it is to maintain its levelness and its tastefulness in design. The Diamond Certified installers were knowledgeable, curtious and fast while providing a quality install. Id say in and out in less than 2 hours. Disadvantages: A slight bit noisy ball return system. Have added some extra sound absorbing. I recently ordered a 9ft diamond pro-am table (blue label) from Heath Manning of Manning Cues and I was one of the lucky customer to have it delivered and installed a week after I fully paid. I couldn't be more happier as I was told that there's a waiting period to get one of these beasts. I had the 3 piece slate with pro-cut size pockets and it plays really great. Heath Manning even go above and beyond to send me another ball rack (Oak Rosewood, the one I got was black) as I ordered. Even after I refused that he didn't have to but because he is such a good and trustworthy person he did it anyway. I would highly recommend him to all my friends or to anyone so what are you waiting for? Reach out to him and you will never regret it. This table is by far one of the best tables I've ever played on. It's only surpassed by the customer service that Manning showed during the ordering process. Manning was absolutely fantastic dealing with all of my questions, and guiding me to the right purchase. He didn't try to sell me things I didn't need, and went above and beyond to make sure I was happy. He called me back after I had sent an email into his site in about 10 minutes. He also called me and responded to questions after hours and on weekends, even when I didn't expect to hear from him for a few days. Manning is the epitome of excellence. Advantages: Reliable answers, guided me, pool table is fantastic, service was on-time and excellence. I am very impressed with the table. It looks sharpe and plays great. The installers did a wonderful job. Advantages: Less expensive in the long run to practice. Your game will improve playing on the top of the line tables. Disadvantages: I haven’t came across one yet. My purchase of my 9 foot Diamond Pro-Am table through Manning Cues was totally professional. You pick up the phone you speak to Heath directly he explains the whole process so that you understand exactly what your buying how your going to pay and when you can expect delivery. I would recommend Manning Cues to anyone who is interested in a Diamond table. My Diamond table plays "Awesome". The wait was worth it. Heath was on it, communicating every step in the process of my order. Starting with the initial order through Diamond factory build, through delivery timelines, through communication of the installers and after the final table setup/completion. As the saying goes "you get what you pay for", this statement is true for both the product (Diamond Pro-Am 8' table) and Manning Cues. Outstanding Product and Service. Advantages: The best table in the industry. Outstanding service and communication from Manning Cues. Disadvantages: The wait for the table build due to the factory build. This statement has no bearing on Manning Cues service. If you're looking for the best table you can buy, this is it. If you're looking for the best place to buy it from, you've come to the right place. Dealing with Heath was an excellent experience from start to finish. He answered all my questions prior to purchase, and kept me updated throughout the time my table arrived. I would not hesitate recommending Manning Cues to anyone, and look forward to dealing with Heath in the future on other purchases! Advantages: Excellent finish on the table. We have mahogany floors with light gray walls. The black finish with gray felt makes the table look as though it's designed for the house. And Heath always responded within a day when I had a question. I upgraded from a very nice looking "furniture grade" table that I thought played pretty well. The difference in the old table and the Diamond Pro-Am is like night and day. Even with the pro-cut pockets, it just seems easier to play on. There's no doubt that it banks and rolls more predictably. Ordering through Heath couldn't have been easier. It's rare to find the level of customer service that he provides. He explains exactly how the process works, and will take the time to answer all questions you have without any pressure. During installation, it was determined that the factory had sent some of the wrong parts with the table, Diamond sent the correct parts overnight so the installation could be completed the next day. When I called Heath, he happened to be at the Diamond factory, and assured me that everything would be taken care of. I believe that Heath will do whatever it takes to make sure that all of his customers are satisfied. Advantages: Customer service and support through Heath is top notch. Diamond certified installers did a great job. Buying anything online is risky, Heath came through just as advertised.Table is beautiful...installers were helpful and friendly.Heath proved very trustworthy!! Just a quick note to tell you that we absolutely love the table! Picture attached for your website as well. Been playing every evening for a couple hours and can’t get enough. The installation was flawless man. They were on time and probably in and out in 45 minutes total. Great guys and very professional. The entire process has been so smooth and professionally handled. I'll be telling everyone that you're the man to deal with for Diamond tables and supplies. Couldn't be happier! "Heath Manning and Manning Cues are simply unmatched. 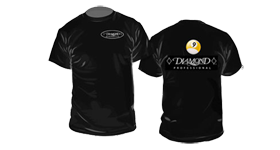 Unmatched in the billiards business...unmatched across all customer service oriented businesses. From the second I reached out inquiring about a Diamond Pool table, Heath was incredibly responsive and incredibly helpful in making my decision. The best part is...the way it started is the way it was all throughout the process. Heath called me from Disney where he was on vacation with his family to answer some follow-up questions I had and then he made sure all the details were perfect. The delivery experience was fantastic and the table plays like an absolute DREAM. If only other companies could learn from Heath...we'd all be happier about doing business online." After much research and reading reviews of the customer service at Manning Cues, I was not disappointed dealing with Heath myself. He made sure the table was exactly what I wanted, kept me up to date on the progress, and followed up after the delivery. If your buying a Diamond table, there is no one else that will customize it and get you exactly what you want! Advantages: It's not a "buy as is" table; you select every aspect of the table. The way I bought a cue shaft last year again after much research, and finding that Manning Cues was the only place I could customize the shaft, the tip, the taper for the same price as "buy as is" found everywhere else. Disadvantages: I find no disadvantage to list. I ordered my 8 ft table through manning cues, set up payment, table was delivered as promised - It was a painless transaction from start to finish and I love my Diamond table! This table was probably the single best purchase of my life! It plays better than any other table I have ever played on. Ordering through Heath was a great experience. He took his time to thoroughly answer all my questions along the way. Highly recommend ordering through Heath. Gary and Mike were the Diamond installers. They were awesome. Two great guys, that took their time, and did a fantastic job setting up my table. No doubt in my mind when my table needs new felt, I will be requesting Gary and Mike through Manning! 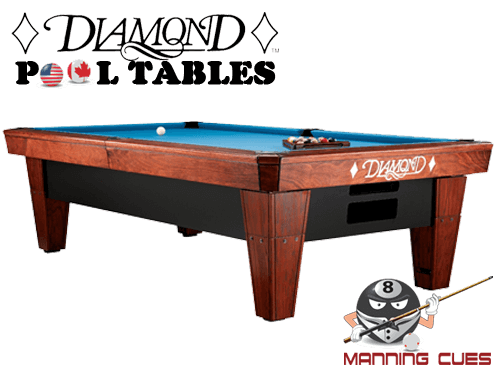 Diamond pool tables are recognized as the highest quality in the market. I recently purchased a 7' Pro AM and I could not be happier with the table or the customer service. Heath Manning started the process of outstanding customer service by using his practical experience and knowledge to guide me through table options while ordering. With his help, I made wise decisions. He set and managed my expectations throughout the process, and he communicated with me directly and frequently. My overall experience with the purchase, delivery, and installation of my 7" ProAm table was simply outstanding. The installation team continued the exceptional customer service that started when I first contact Heath Manning. Advantages: A part of Heath's motto is "earning" business. He certainly does that. Heath understands the essence of genuine customer service. He establishes relationships with his customers and ensures they have a quality customer experience. In a world where true customer service is de-prioritized by high volume sales, uninterested salespeople, and automated systems, Heath fills the void. I have not experienced better customer service. I have purchased more than a few items from Heath and I will continue to do so based on the trust he's established. Additionally, the team that delivered and installed my table provided the same high quality customer service. They communicated with me while they were en-route to my home to let me know exactly when they would arrive. Once at my home, they were professional and courteous. They ensured that I understood the process and answered all questions I had. Their attention to detail and the precision of their installation process assured me that my table would be of the highest quality when completed. I could not have been happier with my experience. My experience with the Diamond certified team is completely opposite of past experiences with other table mechanics. The team was genuinely friendly, courteous, and knowledgeable. Their expertise was obvious as they explained the process, asked questions, and very precisely executed their installation process. The team and their process left me with an assurance that my table was installed and tuned with the highest quality. Disadvantages: There are ZERO disadvantages. Had my 9' Diamond Pro-Am Table installed 2 weeks ago. Almost exactly when Heath said it would happen 12 weeks ago when I ordered. Got a great price and communication with Heath was excellent. Really enjoying the table. It was a pleasure working with Heath when I purchased my Diamond Pro Am table. When I first emailed him with questions regarding the table, I received a telephone call back within two minutes. Heath answered all of questions and gave me a realistic build time and delivery date. There was no need to contact him for updates as he kept me informed every step of the way. My table was actually delivered a month ahead of schedule and was then professionally installed in a couple of hours. I would definitely recommend Heath to anyone looking to purchase a pool table or any other billiard product. Advantages: Heath is true professional, he will keep you informed throughout the process and even follows up after the job is done to make sure you are satisfied. I recently purchased a 9’ Diamond Pro-Am table from Heath at Manning Cues. After researching the project, I was a little scared because of the significant financial investment; however, after my first call with Heath, that slight fear was laid to rest. His attention to detail and customer service was the best I’ve ever seen in any industry! The process was seamless and I was informed every step of the way. The table is the best table on the market, and by far the best table I ever played on. Trust Manning Cues with this process if you going to invest in this type of equipment! I’m simply blown away by the high quality of service that accompanied a high-level pool table. Such a wonderful experience! Thank you, Heath and Manning Cues!!!! Advantages: I bought the best and Manning sent the best installers. These two gentlemen were amazing. They had 15 and 20 years of experience and they knew exactly what to do! The key to owning an amazing table is to ensure the installation is done correctly- they nailed it! Precision and excellence. Very professional and very pleasant. Overall great experience! Table is great, just cant beat a Diamond. Great action off the rails, straight rolls, just cant find a disadvantage to this table.